Over the weekend, Donald Trump's lawyer Rudy Giuliani said that Trump has the right to pardon himself but that he won't do it. Yesterday, the President made it crystal clear that he is asserting the right to pardon himself. Unlike Giuliani, he said nothing about "but I won't do it." Here is his tweet. This is an astounding claim and goes against what the head of the Office of Legal Counsel, Mary Lawton, wrote just before Richard Nixon resigned. In her memorandum, she noted that a self pardon would violate the fundamental rule that no one may be judge in his own case. Taking Trump's tweet to its logical conclusion, it means he could put up a page on the White House Website saying that pardons are available for sale to any and all criminals. Prices start at $10 million, depending on the crime, and checks should be made out to Donald J. Trump. If he were indicted for taking bribes, he could just pardon himself and it would all be perfectly legal. It is doubtful that James Madison had that in mind when he wrote most of the Constitution, but the courts have never ruled on this. Actually, though, we're not left entirely to guesswork when it comes to what James Madison did or did not have in mind. He and his friends Alexander Hamilton and John Jay wrote the Federalist Papers, in which they explored—in great detail—just about every issue raised by the (then-new) Constitution. It is Federalist No. 74 that specifically addresses the pardon power. Hamilton wrote that particular entry, but it's reasonable to assume that Madison was in agreement, or it wouldn't have been published. What No. 74 says, in essence, is that the Founding Parents understood that it might be nice to invest pardon power in a deliberative body—say, the Senate—to make sure that the power is not abused in the manner of the King of England. However, there are cases—say, armed rebellions—where speed is of the essence. Ergo, Madison & Co. concluded that it was best to grant the power to a single individual, the president, and to trust that the president would exercise "prudence and good sense." Implicit in this whole argument is that the pardon power certainly could be abused (by granting pardons to friends and family members and benefactors, the way the king did); the Founding Parents just trusted that the president wouldn't do so. Hamilton did not bother to write, "Of course, the president can't use the pardon power on himself," because that was taken for granted—if using the pardon power to benefit one's friends is presumed to be an abuse, then of course using it to benefit one's self would be even worse. We have further evidence of the Founding Parents' intent in the person of George Washington. Although Washington did not contribute to the Federalist Papers, he was present during the debates over the Constitution. During his eight years as president (well, 7 years and 10 months), he got a chance to take the pardon power out of the wrapper and take it for a spin. And in his very first exercise of the prerogative, he did exactly what was intended, and used it to bring the Whiskey Rebellion to a peaceful end by pardoning the ringleaders. The Father of His Country certainly never considered using it on himself. After all, the statute of limitations on chopping down cherry trees had already run by the time he took office. The president obviously cannot pardon himself. There are arguments on both sides, and it would require the courts to sort it out. The president probably can pardon himself, but would unleash severe political consequences, most likely impeachment and removal. You would have to look long and hard to find a legal scholar who sees it as Trump presents it: "Yes the president can do it, case closed, end of story." Even defender-of-Trump Alan Dershowitz, isn't willing to go there. He actually falls into the second camp. When asked by Anderson Cooper, he said, "Nobody knows the answer to that question." Another minor detail here is that many federal laws have analogs in state law, so a president indicted for violating state law (possibly after leaving office), could still be tried, convicted, and punished according to state law even after having pardoned himself for federal crimes. There is no doubt whatsoever that the president has no power to issue pardons for state crimes. Also, a self-pardon offers no protection against impeachment. California: This is the biggie. As we noted yesterday, California's primary will serve to illustrate the bugs in California's jungle primary system. The most momentous races will be for the House of Representatives, particularly in CA-39, CA-48, and CA-49. Broadly speaking, we will get a sense of Democratic vs. Republican enthusiasm. More specifically, we will see if the blue team can manage to get at least one candidate into the second round of races they are counting on when it comes to flipping control of the House. Mississippi: The Democrats will choose a Senate candidate, who will immediately become a big underdog to Sen. Roger Wicker (R). The frontrunner appears to be long-serving state rep. Omeria Scott, whose interesting claim to fame is that she was one of the first cheerleaders in Mississippi to integrate their high school squad. If it's not her, it will probably be Mississippi House of Representatives Minority Leader David Baria, who is white, and may struggle to rally the Democratic vote in a state where more than half the blue team's voters are black. The most interesting race in Mississippi this year, the one to fill former senator Thad Cochran's vacated seat (currently held by appointee Cindy Hyde-Smith), won't be on the ballot today because it's a special election. Alabama: There won't be many competitive races in Alabama, as a raft of incumbent Republicans are expected to be reelected in November. The one exception may be AL-02, where Rep. Martha Roby (R) has consistently refused to support Donald Trump due to the pu**ygate tape. A number of pretty rabid right-wingers are trying to unseat her—and surprise, they're all men! The two Democrats are both women: Tabitha Isner and Audri Scott Williams. If the GOP dispatches Roby (which probably wouldn't happen until the runoff in July), then it might create an opening for the Democrat who wins today to cobble together a coalition of conservative Democrats, suburbanites, black voters, and offended women. Iowa: The Democrats are going to figure out who their gubernatorial candidate will be: business owner Fred Hubbell (more centrist) or labor leader Cathy Glasson (more liberal). The winner will go on to face Gov. Kim Reynolds (R), who got the job when Terry Branstad was appointed ambassador to China, and who is trying to win a term in her own right. If there's a wave, Reynolds could be vulnerable; she's only moderately popular and may be too closely linked to Donald Trump for Iowans' tastes (he's got 51% disapproval in the state). Meanwhile, IA-3 will have a similar sort of contest, where Cindy Axne, a Democratic moderate backed by Emily's List, will go up against Pete D'Alessandro, a former aide to Sen. Bernie Sanders (I-VT). The survivor will face Trump-loving Rep. David Young (R), who is seen as very vulnerable in the R+1 district. Montana: Sen. Jon Tester (D) will find out which Republican he'll face in November. There are four Republicans running, but two appear to have emerged from the pack. Russ Fagg, a retired judge, is a fourth-generation Montanan with no political experience. Montana state auditor Matt Rosendale is the establishment favorite, and has gotten piles of outside money, but he's lived in the state for only 20 years and is being portrayed by Fagg is a carpetbagger. It is hard to say which one Tester would rather face, but for what it's worth, he's a third-generation Montanan. New Jersey: The Senate race here is going to get interesting in November, when we learn if Sen. Bob Menendez' corruption trial will make him vulnerable to soon-to-be Republican nominee Bob Hugin, a pharmaceutical executive with lots of money in his personal bank account but no political experience. But neither of these men is seriously threatened today, which means that most eyes will be on the many NJ House seats that are going to be hotly contested in November. In four of them, the Democrats have lots of candidates looking to steal a Republican seat. In contrast to California, however, the state party has an iron grip on things, and so the four establishment candidates—State Sen. Jeff Van Drew (NJ-2), navy veteran Josh Welle (NJ-4), former Asst. Sec. of State. Tom Malinowski (NJ-7), and federal prosecutor Mikie Sherrill (NJ-11)—are likely to win. In NJ-5, meanwhile, the GOP has one of its best pickup chances (it's R+4). Perennial candidate Steve Lonegan is more conservative while attorney John McCann is a more outspoken Trump supporter. The winner will face Rep. Josh Gottheimer (D). New Mexico: The Democrats are really hoping to claim the governor's mansion from term-limited Gov. Susana Martinez (R). Today, they are expected to nominate Rep. Michelle Lujan Grisham (D), while the Republicans are going to nominate Rep. Steve Pearce (R). Grisham is Latina, fairly moderate, and a member of a New Mexico dynastic family, while Pearce is pretty far right. If Grisham prevails in November, it should give the blue team the trifecta in the Land of Enchantment. Since Grisham is an overwhelming favorite and Pearce is unopposed, the only thing we'll really figure out on Tuesday is how enthusiastic each side is. Meanwhile, in the race for Pearce's vacated seat (NM-02), the Democrats are all-but-certain to tap water attorney Xochitl Torres Small, a moderate with the support of the establishment, while the Republicans will choose from among a tea partier (Yvette Herrell), a Ted Cruz acolyte (Monty Newman), a former member of the Trump administration (Gavin Clarkson) and a libertarian (Clayburn Griffin). Small has to like her chances against any of the quartet. South Dakota: Rep. Kristi Noem (R) and South Dakota Attorney General Marty Jackley (R) are in a heated battle for the GOP nomination, and the winner will presumably be elected to succeed term-limited Gov. Dennis Daugaard (R). The cannon fodder, er Democrat, in the race will be state senate minority leader Billie Sutton, who is unopposed. Although Donald Trump's choices for personnel have been somewhat, er, unusual (e.g., picking his personal physician to run the Veterans Administration, trying to pick his personal pilot to run the FAA, Ben Carson to run HUD), there actually has been a single guiding principle behind all his choices: He likes only people who are personally loyal to him. As the midterms heat up, he is abandoning that principle in the name of power. He truly wants the Republicans to control the House and Senate next year, and is now willing to endorse candidates who didn't even vote for him. Like Clint Eastwood's character in the "Man Without a Name" movies, Robert Mueller doesn't say much unless he absolutely has to. That means that on those occasions when he does say something, people tend to take notice. Like late Monday afternoon, when he sent members of his team to ask a judge to jail former Trump campaign chair Paul Manafort (who is currently under house arrest). At the center of the new complaint is a European PR firm informally known as the "Hapsburg Group." Manafort secretly utilized these folks' services in 2012 when he was working for the government of Ukraine. According to Team Mueller, Manafort and an associate identified in Monday's filing as Person A (almost certainly longtime colleague Konstantin Kilimnik) have been pressuring the members of the Hapsburg Group to lie to the FBI about the work they did for Manafort. That, of course, is witness tampering and is a felony. Three groups run by David and Charles Koch announced yesterday that they will spend millions of dollars to defeat Donald Trump's tariffs and the other trade barriers he's trying to erect. The groups said that trade is a priority for them and they will work aggressively to educate policy makers about the facts. The way this is likely to work is that members of Congress who promise to work to repeal Trump's authority to unilaterally impose tariffs will discover money coming down upon them like a gentle April rain. Those who support Trump on trade are likely to have well funded primary or general-election opponents. This is the first time the Koch brothers have basically declared war on a sitting Republican president. However, the brothers are about to hit some headwinds. Sen. John Cornyn (R-TX), the Republican whip, commented on tariffs by saying: "I think that's primarily an executive branch function, and I don't really see Congress passing and getting a presidential signature on something constraining his authority." Cornyn needs to get out his pocket copy of the Constitution and read Art. I Sec. 8. The power to regulate trade with foreign nations is explicitly granted to Congress, not the president. Nevertheless, Cornyn has signaled that he is on Trump's side and against the Koch brothers. Also, as a practical matter, any bill to retract the power a previous Congress granted the president would need a 2/3 majority in each chamber to override a certain veto. A fight over immigration is brewing in the House and it could split the Republican caucus badly. Moderate Republicans want to pass a bill that would allow the dreamers to remain in the country and eventually become citizens. The Freedom Caucus calls this amnesty and is dead set against it. The moderates are trying to force one or more immigration bills out of committee and onto the House floor for a vote, and are now just five signatures away from getting to 218, which will trigger a vote the Freedom Caucus and the House leadership absolutely do not want because it will put the split within the caucus out there for all to see. The expectation was that the Court would give a definitive answer to the question of whether a business can legally discriminate on religious grounds. For whatever reason, the Court apparently did not want to rule on such a big question, at least not right now. It's possible they feared that a ruling, in either direction, would open a big can of worms. Or maybe they are trying to stay above the political fray for now, so they'll have credibility when potential tricky decisions come down the pike in the near future (like, "can the President pardon himself?"). Or maybe swing justice Anthony Kennedy, aka the most powerful judge in the country, just couldn't decide. Historically, he's been a big supporter of both individual liberty and LGBT rights, and in this case those two things were on opposite sides. The first documented visit of a sports team to the White House happened shortly after the Civil War, when President Andrew Johnson hosted a pair of amateur baseball teams at what was then known as the Executive Mansion. Such visits happened sporadically thereafter, until 1980, when both the Pittsburgh Steelers and Pittsburgh Pirates were feted by Jimmy Carter after winning championships. Following the two Pittsburgh teams' visits, with the sports-loving Ronnie Reagan now occupying the Oval Office, the tradition was expanded to all four of the major sports (NFL, NBA, MLB, and NHL), and eventually to college teams, Olympians, and a handful of other sports champions. Now, however, the custom may be coming to an end. Already, the reigning NBA champions (the Golden State Warriors) were disinvited, while the reigning MLB champions (the Houston Astros) hemmed and hawed before showing up sans several players. Today, the reigning Super Bowl Champions, the Philadelphia Eagles, were supposed to pay their visit. However, a few of them bowed out because they don't like Trump. Then a few more dropped out because they didn't care for the President's scapegoating of the NFL. Then a few more canceled because they wanted to support their teammates. Once all was said and done, fewer than 10 players, from a roster of almost 70, planned to show up. It would have been inauguration photos, redux. The Philadelphia Eagles are unable to come to the White House with their full team to be celebrated tomorrow. They disagree with their President because he insists that they proudly stand for the National Anthem, hand on heart, in honor of the great men and women of our military and the people of our country. Speaking of L'état, c'est moi (see above), Trump apparently has no problem with demanding the loyalty of his subjects, or referring to himself in the third person. It is unknown whether he initially responded to news of the players' boycotts by declaring, "We are not amused." It should be noted, incidentally, that the Eagles were one of the handful of NFL teams that had no kneeling players last season. 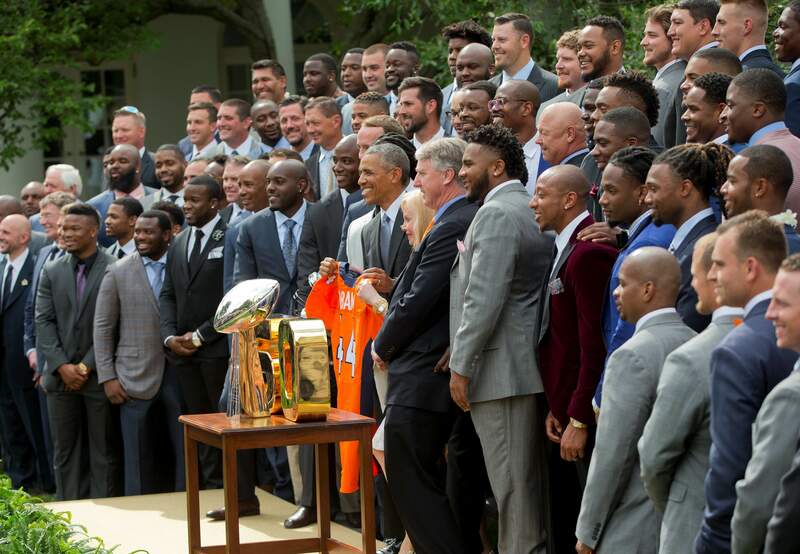 It has been incredibly thrilling to celebrate our first Super Bowl Championship. Watching the entire Eagles community come together has been an inspiration. We are truly grateful for all of the support we have received and we are looking forward to continuing our preparations for the 2018 season. In other words, the football players took the high road, while the President was busy taking...well, a different option. These are players who stand up for the causes they believe in and who contribute in meaningful ways to their community. They represent the diversity of our nation--a nation in which we are free to express our opinions. Disinviting them from the White House only proves that our President is not a true patriot, but a fragile egomaniac obsessed with crowd size and afraid of the embarrassment of throwing a party to which no one wants to attend. Already, the Eagles have been invited to tour the U.S. Capitol building when they play in Washington this season. If someone tried to write a screenplay—say, for the new season of "House of Cards"—in which a fictional politician pulled all the various stunts that EPA Administrator Scott Pruitt has supposedly pulled, nobody would buy it. "It's just too unrealistic," the notes from the studio executives would say. But truth, as they say, is stranger than fiction. And so, yet another item was added to the ledger of Pruitt's alleged misdeeds on Monday. According to reporting from the Washington Post, the Administrator utilized the EPA's director of scheduling and advance, Millan Hupp, as his personal errand runner. Among the tasks she was ordered to handle: Calling the Trump International Hotel in search of a used, discount "Trump Home Luxury Plush Euro Pillow Top" mattress. After 25 days of seclusion, First Lady Melania Trump emerged from hiding—sort of. She appeared at an event on Monday honoring gold star families (presumably not the Khan family, though). For reasons that nobody in the White House was willing to explain, however, the event was closed to the press. One reporter did manage to peek through a doorway and catch a glimpse of Trump, so apparently she really was there. As we have noted, it's likely that nothing nefarious is going on here, but the First Lady's behavior has definitely veered into "odd" territory. She could easily put to rest all of these stories by speaking to reporters for just 30 seconds, but she chooses not to do so. Even more interesting, the West Wing staff, including the President, is apparently not much more knowledgeable than the rest of us. They are reportedly on a "need-to-know" basis, and Melania has decided that currently, they do not need to know. The one thing that is known is that she won't be joining her husband at the G7 or at the Kim Jong-Un summit; both absences certainly run contrary to usual protocol.